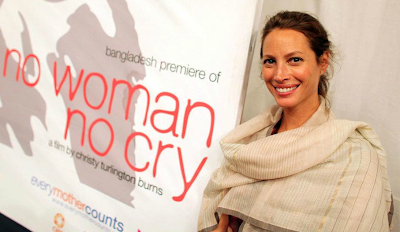 Christy Turnlington Burns is an American fashion model, actor, director, entrepreneur, author, journalist, correspondent, and humanitarian. Turlington began her modeling career in the late 1980s and gained a high profile when she began representing Calvin Klein in 1987. In 1990 she was one of five models on the cover of British Vogue magazine who became cross-industry superstars and helped define the 1990s as the supermodel era. In addition to her ongoing modeling career, she has appeared in many documentaries and has been a business partner in several apparel, health, and beauty ventures. Turlington has been involved with multiple humanitarian projects. She was an anti-smoking activist early in her career, became involved CARE in 2005, is an ambassador for Project Red, and in April of 2010 founded her own nonprofit organization focused on international maternal health, Every Mother Counts. Turlington graduated in 1999 from NYU with a BA focused on comparative religion and Eastern philosophy and as of 2013 is pursuing a MPH degree at Columbia University’s Mailman School of Public Health. She is an adviser to the Harvard School of Public Health Board of Dean’s Advisers and is a member of the Harvard Medical School Global Health Council.